In November–December 2009, a small excavation was conducted at the site of Yiftah’el (Area J; Permit No. A-5780; map ref. 22186/74011), prior to the installation of an electric pole. 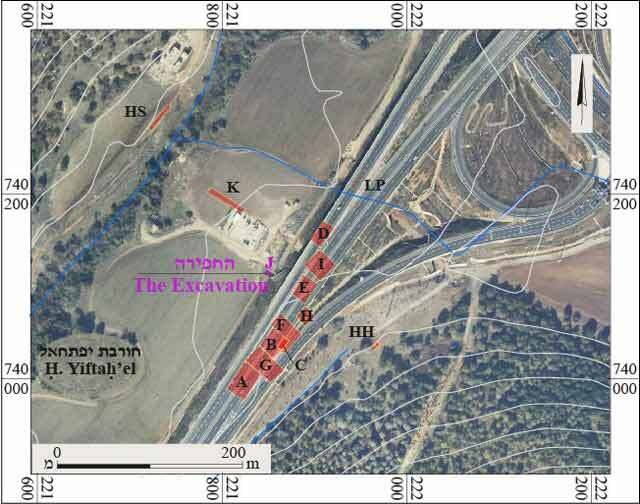 The excavation, undertaken on behalf of the Israel Antiquities Authority and financed by the Israel National Roads Company, was directed by N. Getzov, with the assistance of Y. Lavan and Y. Ya‘aqobi (administration), A. Shapiro (GPS), R. Mishayev (surveying and drafting) and S. ‘Atal (registration). Z. Horowitz followed the excavation and rendered additional assistance. The site of Yiftah’el is located on a terrace, east of Nahal Yiftah’el, near Horbat Yiftah’el (Khirbat el-Khalladiya), which has been identified as the biblical Yiftah’el. Many excavations were carried out at the site over the years (Fig. 1): Areas A and B were excavated by Eliot Braun (Braun 1997); Area C was excavated by Yosef Garfinkel (Garfinkel et al. 2011:13–36); Area D was excavated by Avraham Ronen, Moshe Davis and Mordechai Lamdan (Garfinkel et al. 2012:48–55); Area E was excavated by Ofer Marder, Hamoudi Khalaily and Ianir Milevski (Garfinkel et al. 2012:36–47); Areas F–I were excavated by Hamoudi Khalaily, Ianir Milevski and Nimrod Getzov (Garfinkel et al. 2012:56–59); Area K was excavated by Hamoudi Khalaily and Ron Lavi (Khalaily 2014); Area HH was excavated by Hamoudi Khalaily (Khalaily 2011); Area HS was excavated by Howard Smithline (Smithline, pers. comm.) and Area LP was excavated by Leea Porat (Porat and Khalaily 2011). Extensive areas were exposed in these excavations and settlement remains from the following periods were discovered: Pre-Pottery Neolithic B, Pottery Neolithic (the Lodian culture and the Nahal Yiftah’el horizon; Getzov, Milevski and Khalaily forthcoming), Early Bronze Age IA and Intermediate Bronze Age. In addition, pottery sherds dating to the Middle Bronze Age II and the Roman period were found. The current excavation was conducted in Area J where five strata (I–V; Fig. 2) were revealed. Stratum V. This stratum is characterized by a reddish brown layer of grumusol, devoid of any remains. Stratum IV. An accumulation of gray soil, rich in small angular stones. This stratum contained a large quantity of flint items, mainly the debitage of naviform blade production. Sickle blades, arrowheads, drills, scrapers and a variety of other tools were also discovered. The stratum dates to the middle of the Pre-Pottery Neolithic B.
Stratum III. A wide pit that was dug into Stratum IV. The pit was filled with soil containing numerous flint items and pottery ascribed to the Nahal Zippori horizon, which dates to the end of the Pottery Neolithic period (Getzov, Milevski and Khalaily in press). A fragment of a large stone basin was found at the bottom of the pit. Stratum II. This stratum consisted of an accumulation of brown-gray soil and numerous fieldstones. Many flint items, and pottery sherds, dating to the Early Bronze Age IA were found between the stones. Several sherds that are ascribed to the Nahal Zippori horizon and the Late Chalcolithic period (Ghassulian culture) were also discovered in this stratum. This is the first time that pottery of the Late Chalcolithic period was found at the site of Yiftah’el, but there is not enough to identify cultural affiliation. Stratum I. An accumulation of light red-brown soil, containing a small number of flint tools, pottery from the Intermediate Bronze Age, and many small pottery sherds from the Middle Roman period. Past excavations yielded valuable information about the earliest settlements at the site, but the boundaries of the settlements and the population size in the different periods are still insufficiently known. The current excavation contributed to our knowledge regarding the extent of the settlement in the different periods, and uncovered previously unknown remains from the Late Chalcolithic site. Braun E. 1997. Yiftah’el: Salvage and Rescue Excavations at a Prehistoric Village in Lower Galilee, Israel (IAA Reports 2). Jerusalem. Garfinkel Y., Dag D., Khalaily H., Marder O., Milevski I. and Ronen A. 2011. The Pre-Pottery Neolithic B Village of Yiftahel. The 1980s and 1990s Excavations (bibliotheca neolithica Asiae meridionalis et occidentalis). Berlin. Getzov N., Milevski I. and Khalaily H. in press. The Nahal Zippori Horizon: Between the Lodian Culture and the Wadi Rabah Culture (Hebrew). Khalaily H. 2011. Yiftah’el. HA-ESI 123. Khalaily H. 2014. Yiftah’el, Area K. HA-ESI 126. Porat L. and Khalaily H. 2011. Yiftah’el. HA-ESI 123. 2. The southern section of the excavation.